Following my previous article, “Becoming a Catholic Pastor, Post – ‘Pennsylvania’”, I unplugged from the world of ecclesial and secular news. I tried to follow my own advice and focus on the duties of my own state in life. In general, I don’t follow the news much anyway, but this month I was particularly oblivious. In fact, other than priest friends, no one has even mentioned the scandals unfolding in the Church. In the little town of Mattawa, for good or ill, the problems of the world flow past us, like the two rivers that meet here, and we keep living our lives. This weekend, however, I am reminding my parishioners of our need to pray for the universal Church, particularly the hierarchy. Today is the feast of the Archangels. It was formerly just the feast of St. Michael, while Saints Gabriel and Raphael were honoured on March 24th and November 24th respectively, but the 1969 revision of the General Roman Calendar put them all together on September 29th. I mention this historical fact because it is my excuse for only focusing on St. Michael in this article. 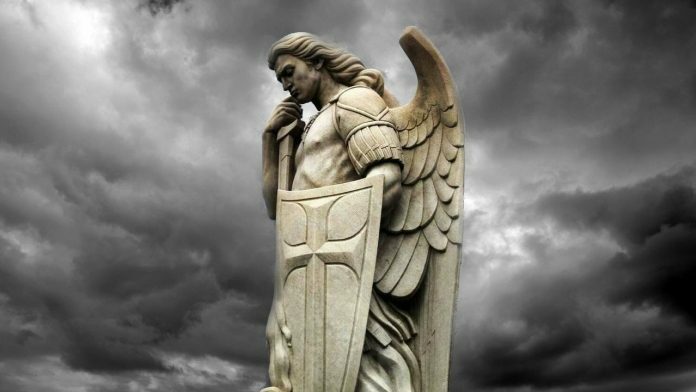 This weekend I am using the occasion of St. Michael’s feast as an opportunity to encourage devotion at my parish to God’s great warrior: beginning today, we will recite the prayer to St. Michael after each Mass. At the end of the 19th Century Pope Leo XIII added the prayer to St. Michael to the prayers recited after Low Masses, the so-called Leonine Prayers. This custom held until 1964 when the Leonine Prayers were suppressed at the Second Vatican Council (AAS 56, p. 888 par. 48. J). Suppressed means suppressed, right? Does that mean we shouldn’t say the prayer to St. Michael after Mass? Sacrosanctum Concilium (the Church’s Constitution on the Liturgy) states, “Therefore no other person, even if he be a priest, may add, remove, or change anything in the liturgy on his own authority” (SC 22). That norm was broken many times in the years following the Second Vatican Council; however, that’s no excuse for me to make “good” changes to the liturgy. I am striving to be a faithful son of the Church and I don’t want to abuse the liturgy or contribute to confusion regarding its integrity, so I will give a brief explanation of my decision to recite the prayer to St. Michael with my congregation after Mass. That sound tradition may be retained, and yet the way remain open to legitimate progress careful investigation is always to be made into each part of the liturgy which is to be revised. This investigation should be theological, historical, and pastoral. Also the general laws governing the structure and meaning of the liturgy must be studied in conjunction with the experience derived from recent liturgical reforms and from the indults conceded to various places. Finally, there must be no innovations unless the good of the Church genuinely and certainly requires them; and care must be taken that any new forms adopted should in some way grow organically from forms already existing (SC 23). Reciting the prayer to St. Michael after Mass seems to be an organic development that is in accord with the tradition of the Church. Reciting the prayer to St. Michael after Mass is rapidly growing in popularity. It is being requested by many among the laity and even mandated by some bishops. The current drama in the Church is a painful reminder that human powers are insufficient to build the Kingdom of God and, sadly, they often undermine it. Satan and his legion are at work in the world and they often twist human powers toward their own ends. Therefore, we need to be more strategic in our fight. In the Eastern Churches, the faithful refer to St. Michael as the “Archistrategos”, the chief general of God’s army. The English words ‘strategy’ and ‘strategist’ are derivatives of strategos. St. Michael cast Satan out of heaven in their first battle (cf. Rev. 12:7-10), he continued to fight the powers of evil in Biblical times (e.g. Dan. 10:13-21), and he still fights for those who invoke his name today. St. Michael the Archangel defend us in battle! Previous articlePatching the Chinese Schism?